The Rs100 crore issue, to support the water supply and sewerage components of a Rs589 crore infrastructure investment programme, was a success. The results encouraged many other municipal corporations to float bonds with investment grade ratings and investors, both private and public, grabbed the opportunity. Despite the good performance, the municipal bond market is only 0.1% of the total corporate bonds traded in India. In the US, where such bonds have been in the market for the past 120 years, municipal bonds constitute about 12% of the overall corporate bond market in the country. In the last six years, municipalities in India issued 13 bonds amounting to Rs733 crore. In the US, the market of such bonds is $2.5 trillion (Rs98.5 trillion). An international conference on developing India’s municipal bond market in Mumbai on Monday emphasized the need for encouraging investors to consider municipal bonds as an attractive alternative to other financial instruments. The conference was organized by USAID, an international development agency of the US government, the National Institute of Securities Market, a public trust unit of the Indian capital market regulator, the Securities and Exchange Board of India (Sebi), and rating agency Crisil Ltd.
Sebi chairman M. Damodaran has assured that the market regulator would do whatever it could to strengthen the municipal bond market in India. 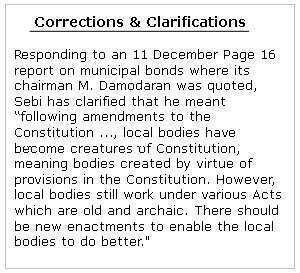 According to Damodaran, local bodies are influenced by politics and shy away from taking harsh decisions at the time of need. He also criticized the management practices and lack of capable human resources on the boards of local bodies. 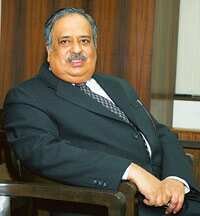 “They have become constitutional creatures rather than statutory creatures," Damodaran said. High investment requirements in government securities also is a roadblock to the development of a proper municipal bond market in India. “Municipal bodies should be independent to approach capital markets," Deikun added. India has huge domestic savings, said USAID director for the office of development credit John Wasielewski. “If properly mobilized, this can unleash a massive capital that can take care of developing both rural and urban infrastructure." According to the Jawaharlal Nehru National Urban Renewal Mission estimates, India needs more than Rs1.2 trillion of investment in urban infrastructure over the next seven years. More than 60% of the investment will be government funded, but urban local bodies (ULBs) will still need to find Rs45,000 crore to contribute. “This sum is far in excess of what the ULBs can themselves generate through their operations," said Roopa Kudva, managing director and chief executive officer, Crisil. “Crisil estimates that ULBs will need to borrow a total of Rs30,000 crore to finance their contribution, and the borrowing will need to be of a minimum tenure of 10 years, inline with the payback on the projects." There are two examples— Karnataka and Tamil Nadu—that the World Bank is presenting as a model for the developing world, says Wasielewski. “You have more than hope here," he says. “You have facts." USAID guaranteed 50% of the principal amount of bonds floated to support water, sanitation and sewerage projects in Tamil Nadu and Bangalore.